If you're on the go, or whenever you simply need to make a quick reference, you'll find this tiny yet practical book to be a great friend in your immersion into American Sign Language and the Deaf community. This handy little Pocket Guide contains definitions to those not-so-familiar terms that you may encounter at any time, anywhere. This is not an ASL dictionary, but a convenient Deaf community terminology guide. You will learn the definitions of words/acronyms such as: Audism, CODA, DPN, and more! Beginning when she was only thirteen years old, Michelle Jay has understood her passion and love for ASL. As a hearing person in the Deaf community, Michelle was determined to master everything she could about ASL... not just "how to sign" but the very best ways to learn to sign as well! As the founder of StartASL.com, the leading online resource for ASL and Deaf Culture, Michelle has tremendous insight into this unique community. Michelle earned a Bachelor's Degree in Deaf Studies, with an emphasis in teaching, from one of the nation's premier programs at California State University, Northridge. When not writing books or tending her website, Michelle contributes thought-provoking articles to academic publishers such as Greenhaven Press. Her unique articles have done much to support Deaf Culture, and have been printed in resource publications such as American Chronicle and Perspectives on Diseases & Disorders: Deafness & Hearing Impairments. This little book is a brief, pocket dictionary of terms (vocabulary) one can encounter in ASL / Deaf-World studies and interactions. This is NOT an ASL language dictionary with signs, images, or translations. This guide contains words and acronyms used in association with Deaf culture, services, education, technology, and discussion. This book is best as a travel companion for those folks who may not want to carry around larger books or resources. It can be conveniently poked into a book-bag, backpack, or briefcase without adding any significant bulk or weight. It pretty much has the same information that appears in the Step 5: Learn the Terminology section of Don't Just Sign... Communicate: A Student's Guide to ASL and the Deaf Community...just in a compact format. I like it, but I admit to using it a lot less than the main books in the Start ASL Presents series. I give it four stars instead of five because, for me, there wasn't anything new or needed here when I had the other material. (When I purchased this, I expected something slightly different since I had the larger study books. I had thought it might be necessary since it was suggested as a companion book.) 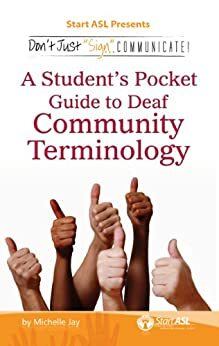 However, I can see that this quick reference pocket guide might be useful for some people who are participating in Deaf-World events, ASL Workshops, Deaf Education seminars, research, classes, presentations, and activities like these. It also would be helpful for people who are reading lengthy, scholarly materials such as Journey Into The Deaf-World by Harlan Lane, Robert Hoffmeister and Ben Bahan. This is good info to know, however it is NOT worth paying $8 for the paperback when it's only a dollar on Kindle (e-reader). This is literally a list of acronyms and some terms used in the deaf culture/community and a very brief description. There are no signs or pictures in this book explaining how to do a sign. This author's other books are amazing - I have them both on my kindle and in paperback (for different family members) and they've been VERY helpful!!! Not what I expected. Very disappointed. There is nothing 'pocket' (8 1/2" L x 5 1/2"W) about the size of this "brochure". This book may be helpful to the person who is NOT taking ASL courses. It is just an alphabetical abbreviated glossary of some terminology and organizations. (ex: "ASL: American Sign Language.) VERY over-priced! This was mostly my fault. I should have done more research. This is nothing more than a listing of acronyms and associations dealing with the deaf. I thought it would have signing included. Nope. I took a sign language class years ago and wanted to relearn it because I own a service oriented business. Learning sign language is great, but I wanted a little more understanding and this book gives a comprehensive list of words and acronyms along with some interesting info.